Last night’s episode of Grey’s Anatomy focused on the complexity of the relationships between the Surgeons at Seattle Grace in “Not Responsible”. We went back to the baby dilemma between Mark, Callie and Arizona this week. Arizona and Mark find themselves disagreeing over the decision for Callie to have an “amniocentesis” or not. Callie was once again caught between the two but decided to go with Arizona and have the procedure. Arizona later revealed to Callie that while she respects Mark’s role in the decisions, this is not what she wanted. She wants a relationship between herself and Callie, not herself, Callie and Mark. I’m still surprised it took Arizona this long to say this to Callie. A few months ago Arizona didn’t even want children so she took the news pretty well. I hope Callie listens to what Arizona is saying, they are a beautiful couple but at the same time, Mark is in that relationship. It will be interesting to see what Callie chooses to do in terms of Mark. Sticking with Mark, I’m sorry Slexie fans! Last night Lexie and Avery got together after Avery told Lexie he would be in a queue waiting for her. I’m disappointed at this. I’m not expecting Lexie to be OK with the baby decision but Mark just seems to have forgotten about Lexie and isn’t even trying to win her back. Let’s hope this is just a fling with Avery, I really love Mark and Lexie together. There wasn’t any good news for Meredith last night as it was revealed that her fertility drugs were affecting her eyesight. Lucy (after rejecting Alex for a second time) told Meredith that she must immediately stop with the drugs. I was extremely sad for Meredith. As a huge Meredith fan, I am desperate for her and Derek to have a child, very soon. I think Shonda is really starting to annoy these fans now, it’s one thing after another for Meredith and Derek. Let them have a baby and be happy for once! Adele was back this week after suffering another fall. This time Bailey was on her case and agreed with Meredith that something must be mentally wrong with her as she was not coherent or consistent with her stories. 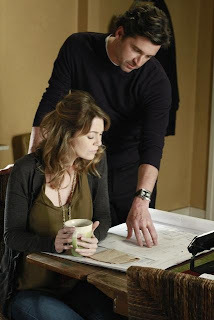 At the end, we see the Chief approach Derek and ask him to take a look at Adele and assess what is wrong with her. This was very brave of the Chief, it was clearly hard for him to do. Overall, it was another great episode from Grey’s! A little bit heavy on the relationship side but the medical cases were interesting, what we saw of them anyway, which wasn’t much, and they were also very relationship focused. But that’s Grey’s Anatomy for you. We also saw Stark ask April out on a date after she convinced him to change his mind about a patient and Christina and Owen argue over having children (baby overload right now). I want to see more episodes like last week and the week before were the relationship story lines were balanced with the medical story lines. This is a medical show and episodes like last night, although still enjoyable and great, they make the show feel a bit “soap” like. Let’s hope the writer’s have some awesome medical cases up their sleeves.